Steamed glutinous rice wrapped in bamboo leaves.......traditionally eaten around the Dragon Boat Festival. That looks very good, but whats in the middle (the red)? 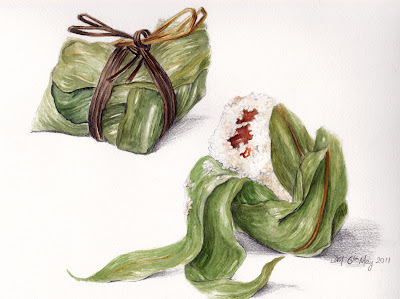 I like that you drew one open as well, and the colours of the bamboo leaves are very good. Sometimes my daughter and I go to the Asian superstore here, and we get our favourite (besides form a ton of other goodies) rice/greentea treats and red bean treats, they are so good. I might just have to go there this weekend.